Where to go and what to drink after the lifts close. Apres-ski is a philosophy—far more than the sum of its parts. Generally speaking, apres-ski is the socializing, snacking and drinking after a day spent gliding on the fine powder of Utah (or elsewhere). Some enjoy the ritual passively, some adhere to it dogmatically, and some don’t even need to ski to relish the lavishness of apres. A Hot Toddy while watching the sunset over Mount Superior, an Avalanche cocktail while reliving hairsplitting chutes—there’s nothing better to wind down a day and enjoy the fruits of a hard-riding skier or boarder’s exertions. There are many apres-ski destinations to tantalize one’s tastebuds. Here are some highlights along the Wasatch, focusing on the warm side of things. After all, it’s darn cold out there. At the base of Big Cottonwood Canyon lies “a little slice of home, the wooden A-frame for everyone,” says Edd Hutchins, bar manager of Porcupine Pub & Grille (3690 Fort Union Boulevard, 801-942-5555, PorcupinePub.com) before proving that this really is a locals’ bar by naming everyone sitting at the wooden plank. 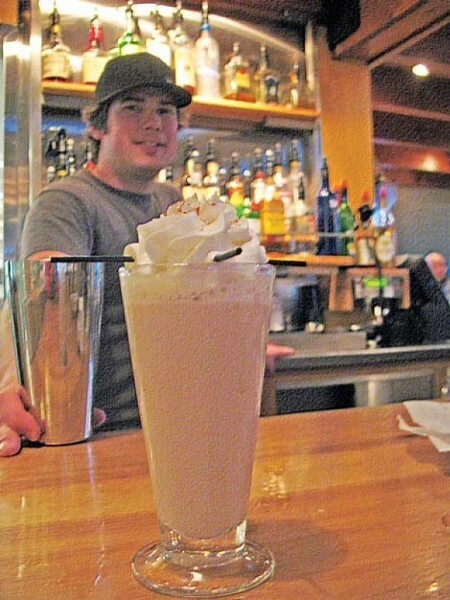 The Porc—as dubbed by faithful followers—is home to some of the tastiest hot libations, which include: Avalanche (Baileys, Kahlúa and vodka, topped with whipped cream, cinnamon and nutmeg, and the straws look like a snowburied skier), Cinnamon Toast (Captain Morgan, spiced cider, a cinnamon stick, and an orange peel), and Hot Buttered Rum (Meyers dark rum, two scoops of butter and a heaping spoonful of brown sugar). “Apres-ski is a continuation and celebration of a special day, keeping it sacred before going back to our lives,” says Hutchins. If you’re in Little Cottonwood Canyon, what better place to quaff than Sitzmark (Alta Lodge, 800-707-2582, Altalodge.com)? Voted City Weekly’s “Best apres-ski nook” in 2008, it’s located at the top of Alta. Cozy, with ambient lighting and comfortable leather chairs, the Sitzmark is also classic with wood trim dating to 1939 when the lodge first opened. The fireplace or the little bar-side nook make for great places to settle down for something warm and to munch on complimentary hummus or guacamole with chips. Manager Brian Lohnas says, “The view of the sunset, overlooking High Rustler and the Collins lift, can’t be beat.” Lohnas beckons locals, returning guests and weekend warriors alike to try Sitzmark’s specialties: the Hot Toddy and the Party Marg[arita]. Along with blue-collar beer, you will get free fried food and popcorn, or you can purchase delicious chili verde. Rayes advocates for apres-ski: “On a powder day, why would you leave only to join the brakelight parade, the metal snake, when you can just relax and have a beer?” Other good apres-ski haunts include Goldminer’s Saloon (Goldminer’s Daughter Lodge, 801-742-2300) at Alta; Tram Club and Wildflower Lounge (The Iron Blosam Lodge, Level 3, 801-933-2230) at Snowbird; Brighton’s Molly Greens (12601 E. Big Cottonwood Canyon, 801-532-4731); Silver Fork Lodge (11332 East Big Cottonwood Canyon Road, 801-533-9977); and, finally, the neighborhood pub turned late-night music venue, Hog Wallow (3200 East Big Cottonwood Canyon Road, 801-733-5567).